The Bulldogs fell by one goal to Denver in 2017, which was followed by an offseason in which 10 players departed, including four of their top five scorers. But coach Scott Sandelin led a young, ambitious team right back into the championship in 2018 where they claimed the NCAA title. Sandelin’s commitment to building a strong program has been impressive as he’s steadily added to his 396-322-89 record. It’s been all about resilience in Duluth and that resilience has been on display. After being swept by then-No. 1 St. Cloud State in its final series of the regular season, the team has pulled together to win seven straight, marching to the NCHC title and back into the NCAA championship game. There’s no go-to game-changer for the 28-11-2 Bulldogs, who are largely a by-committee team. Teams without a bona-fide offensive star typically show it in overall offensive and that’s the case here, as their plus-51 goal differential (130 GF, 79 GA) doesn’t jump off of the page like UMass’ plus-71 (151 GF, 80 GA). But resilience and a dedication to defense is what has carried them this far and Sandelin’s team is great at sticking to its game and taking care of its own zone. One of those defensemen is Dylan Samberg, an often-overlooked piece of the Bulldogs’ blue line. Samberg isn’t the flashiest player in the offensive zone with just 19 points (7 G, 12 A) in 38 games, but the sophomore leads the Bulldogs with a plus-21 rating. Samberg has been a rock in front of netminder Hunter Shepard, who has played all but 16 minutes of the team’s 41 games. It was defense that won the Bulldogs the 2018 NCAA championship and it’ll be defense again should they claim the 2019 title. 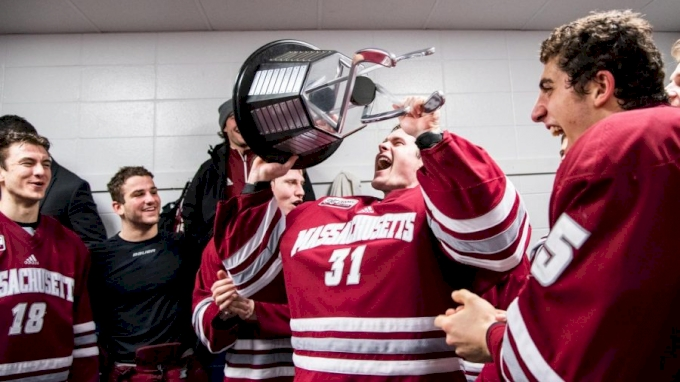 But nothing’s guaranteed, as an electric UMass team stands in the way during a historic season that has seen the Minutemen go 31-9-0. Coach Greg Carvel has created a winning program and is quickly turning his 53-58-4 record at UMass around with the immense talent on his roster. That talent starts with defenseman Cale Makar, who has all but won the Hobey Baker Award as the top player in the NCAA. The sophomore leads the Minutemen with 49 points (16 G, 33 A) and has been the undeniable star of UMass’ impressive season. That says a lot given the team’s three other 40-point players in Jacob Pritchard, Mitchell Chaffee, and John Leonard. The high-powered offense of the Minutemen will be the ultimate test for Duluth’s defense. But the X-factor is forward Bobby Trivigno. The freshman has been a steady depth player and has nine points (6 G, 3 A) over his past nine games and was all over the place in Thursday’s win over Denver. He’s buzzing and with the addition of Makar, elite scorers, the season-long ride all capped off with the OT thriller from Thursday, Duluth will have its hands full in the championship. Don’t miss the Bulldogs and face off against the Minutemen in the championship game this Saturday in Buffalo at 8 PM ET.